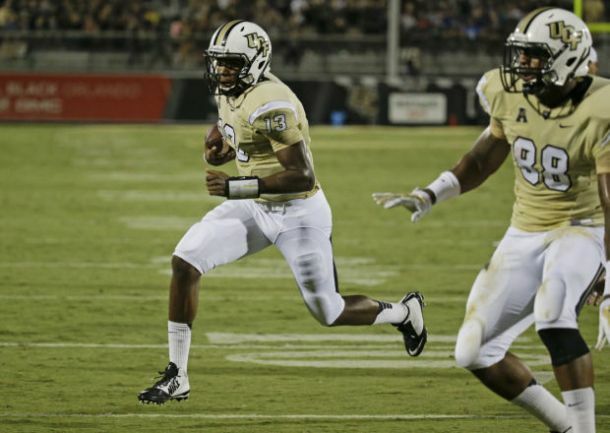 Central Florida came from behind to defeat BYU in overtime on Thursday night. Justin Holman's four yard touchdown pass to William Stanback was enough as the defense held firm on BYU's possession to seal the win. That turnover came when BYU started on the Central Florida 39 yard line. After Christian Stewart hit Paul Lasike for a 19 yard gain, Stewart then threw into the end zone, but it was over his receiver's head and intercepted by Jacoby Glenn for a touchback. BYU opened the second half on fire. Their first drive tied the game at 10 when Stewart connected with Colby Pearson for a 4 yard touchdown and then got a great bounce on a punt on the next drive. BYU's punt hit a UCF player blocking and was immediately recovered by Algernon Brown. Two plays later, Stewart hit Devin Mahina for a 15 yard touchdown and BYU led 17-10. Christian Stewart played well in his first start since Taysom Hill's injury. Stewart went 22 of 37 for 153 yards with 3 touchdowns and an interception. He also ran 13 times for 52 yards.